I found the component labeled "TYC-365GWB" inside an old digital satelite decoder from Tevion. As I didn't find any datasheet for this, I figured out the pinout by myself. This one is common catode. I also found another 7-segement display inside a decoder. This time the pins were nicely labeled on the PCB. It didn't take me that long to realise that this second display was a common anode. Pin 3 should control the dots, but either they are broken or not implemented for this component. 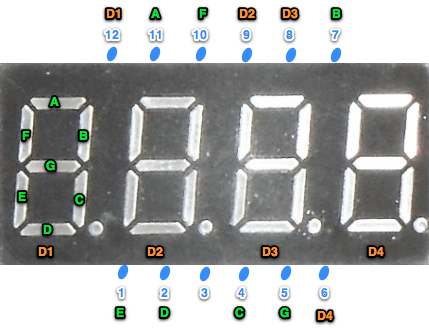 Segments light up when any of the green marked pins is connected to 5V and the corresponding digit pin (organge) is tied to ground. I think this is a "common cathod" configuration. As said, the pins were nicely labeled on the PCB, so I didn't have to figure them out by myself. As my library was written for a common catode display, I had to twaek it to make it work with this new display. I made it dynamically configurable, so now it can be used for both type of displays. I took the example code from Sparkfun. As the latter is for a "common anode" component, I had to exchange the ON/OFF states. Please note that you don't need to use PWN enabled pins. I also found the library "multiplex7seg" but it isn't compatible with the Arduino Mega 2560. I succeded to make it compatible, but it isn't displaying the 4 digits really nicely (also not with the Arduino Uno!). If I only use two of them, it's OK.